Thunderstorms are generated by thermal instability in the atmosphere, and represent a violent example of convection—the vertical circulation produced in a fluid made thermally unstable by the local addition or subtraction of heat and the conversion of potential to kinetic energy. The convective overturning of atmospheric layers that sets up a thunderstorm is dynamically similar to convective circulations observed under laboratory conditions, where distinct patterns are generated in liquids by unequal heating. The orderly circulations produced in a laboratory are rarely encountered in the atmosphere, where areas corresponding to the rising core of laboratory convective cells are marked by cumulus and cumulonimbus clouds. Clouds are parcels of air that have been lifted high enough to condense the water vapor they contain into very small, visible particles. These particles are too small and light to fall out as rain. As the lifting process continues, these particles grow in size by collision and coalescence until they are large enough to fall against the updrafts associated with any developing convective clouds. Cumulus (for accumulation) clouds begin their towering movement in response to atmospheric instability and convective overturning. Warmer and lighter than the surrounding air, they rise rapidly around a strong, central updraft. These elements grow vertically, appearing as rising mounds, domes, or towers. 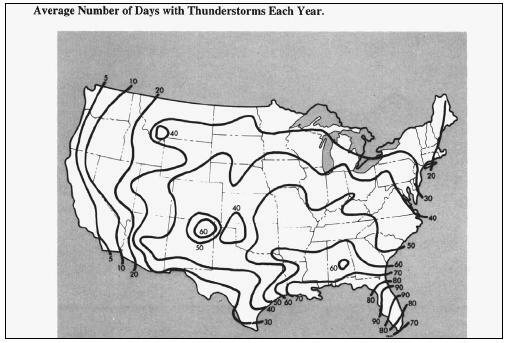 The atmospheric instability in which thunderstorms begin may develop in several ways. Radiational cooling of cloud tops, heating of the cloud base from the ground, and frontal effects may produce an unstable condition. This is compensated in air, as in most fluids, by the convective overturning of layers to put denser layers below less-dense layers. Listed below are the rainiest cities in the U.S. Average number of days with rain is shown parenthetically. 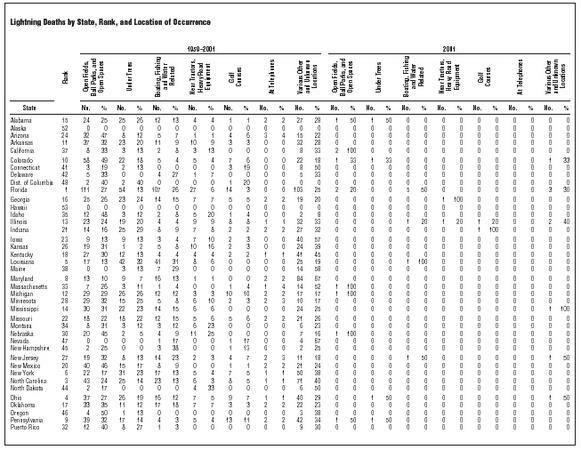 Listed below are the U.S. cities with the least amount of rain. 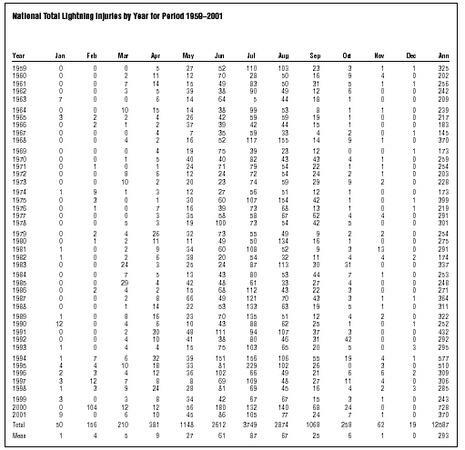 The average number of days with rain is shown parenthetically. 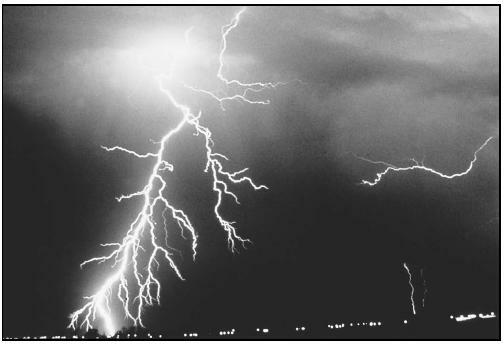 It is estimated that lightning flashes occur somewhere on Earth about 100 times each second. of horizontal winds into the center of a low-pressure area forces warm air near that center upward. Where these processes are sustained, and where lifting and cooling of the moist air continues, minor turbulence may generate a cumulus cloud, and then a towering cumulonimbus system. The pattern of the vertical air movement in the center of the cumulus or cumulonimbus cloud system mimics the behavior of each convective cell. Most thunderstorms have, at maturity, a series of several cells, each following a life cycle characterized by changes in wind direction, development of precipitation and electrical charge, and other factors. 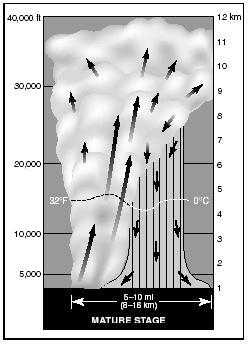 In the first stage of thunderstorm development, an updraft drives warm air up beyond condensation levels, where clouds form, and where continued upward movement produces cumulus formations. The updraft develops in a region of gently converging surface winds in which the atmospheric pressure is slightly lower than in surrounding areas. As the updraft continues, air flows in through the cloud's sides in a process called entrainment, mixing with and feeding the updraft. 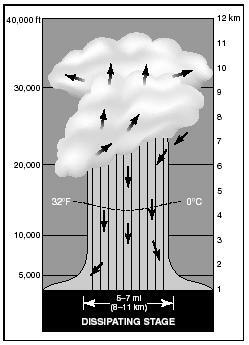 The updraft may be further augmented by a chimney effect produced by winds at high altitude. A developing thunderstorm also feeds on another source of energy. Once the cloud has formed, the phase changes of water result in a release of heat energy, which increases the momentum of the storm's vertical development. The rate at which this energy is released is directly related to the amount of gaseous water vapor converted to liquid water. As water vapor in the burgeoning cloud is raised to saturation levels, the air is cooled sufficiently to liberate solid and liquid particles of water, and rain and snow begin to fall within the cloud. 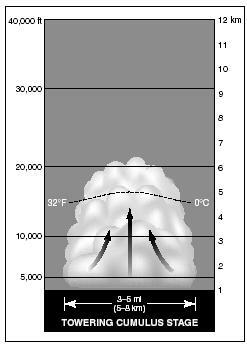 The cloud tower rises above 1.8–3.1 mi where fibrous streamers of frozen precipitation elements appear; this apparent ice phase is thought to be a condition of thunderstorm precipitation. The formation and precipitation of particles large enough and in sufficient quantity to fall against the updraft marks the beginning of the second, mature stage of a thunderstorm cell. air, and by evaporational cooling caused by interactions of entrained air and falling precipitation. The mature storm dominates the electrical field and atmospheric circulation for several miles around. Lightning—the discharge of electricity between large charges of opposite signs—occurs soon after precipitation begins, a clue to the relationship of thunderstorm electrification and formation of ice crystals and raindrops. At maturity, a thunderstorm cloud is several miles across its base and may tower to altitudes of 40,000 ft or more. The swift winds of the upper troposphere shred the cloud top into the familiar anvil form, visible in dry regions as lonely giants, or as part of a squall line. to die. The violent downdraft initially shares the circulation with the sustaining updraft, but then strangles it. 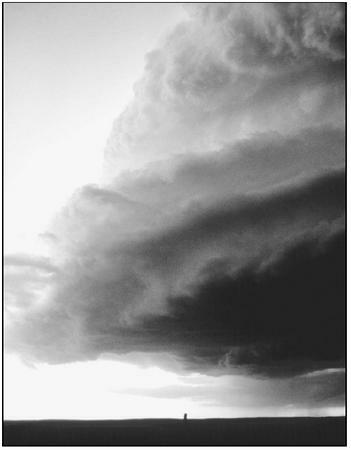 As the updraft is cut off from its converging low-level winds, the storm loses its source of moisture and heat energy. Precipitation weakens and stops, and the cold downdraft ceases. And the thunderstorm, violent creature of an instant, spreads and dies. Storms, based on their physical characteristics, can be classified into four basic categories: single cell, multicell cluster, multicell line, and supercell. Though single-cell storms are rare and relatively weak, they can produce brief bouts of severe weather lasting 20–30 minutes; these storms are not well organized and are seemingly random in occurrence. In the unstable single-cell environment, oftentimes pulse severe storms form. Pulse severe storms produce brief heavy rainfall, severe hail and/or microbursts, and occasionally, weak tornadoes. Single-cell storms are difficult to forecast. of cells moving as one entity; the cells continuously roll through different storm cycles at different times. The most mature cells are found at the center of the cluster, new cells form at the upwind (usually the west or southwest) edge, while the dissipating cells are found at the downwind (usually east or northeast) edge. Multicell clusters are stronger than single-cell storms, and produce heavy rainfall, down-bursts (wind speeds reaching 80 mph), medium-sized hail, and periodic tornadoes. A long line of storms with a leading edge of strong wind gusts is called a multicell line storm, or squall line. Moving forward, the wind gusts of cold air force unstable warm air into the updraft at the stormfront's edge; heavy rain and large hail immediately follow. A large area behind this produces lighter rain. Squall lines produce golf-ball-size hail, heavy rains, tornadoes, and most notably, weak to strong downbursts. The most severe (and rare) type of thunderstorm is the supercell. It is a highly organized storm consisting of one main updraft that can reach 150–175 mph. This rotating updraft is called a mesocyclone and works to produce extremely large hail (2 in), major downbursts (80 mph), and fierce tornadoes. 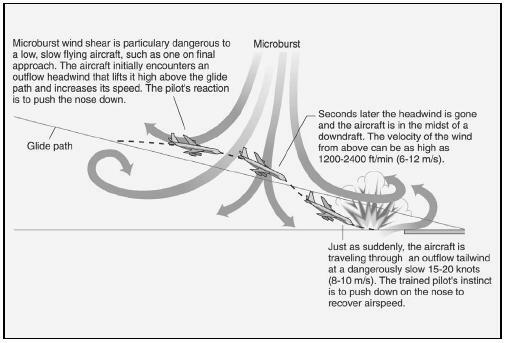 Microbursts are small-scale, hard-hitting downdrafts that result in both vertical and horizontal wind shears that can be extremely hazardous to low-altitude aircraft. KEEP AN EYE ON THE WEATHER DURING WARM PERIODS AND DURING THE PASSAGE OF COLD FRONTS. When cumulus clouds begin building up and darkening, you are probably in for a thunderstorm. Check the latest weather forecast. KEEP CALM. Thunderstorms are usually of short duration; even squall lines pass in a matter of an hour or so. Be cautious, but do not be afraid. Stay indoors (away from windows and doors) and keep informed. KNOW WHAT THE STORM IS DOING. Remember that the mature stage may be marked on the ground by a sudden reversal of wind direction, a noticeable rise in wind speed, and a sharp drop in temperature. Heavy rain, hail, tornadoes, and lightning generally occur only in the mature stage of the thunderstorm. CONDITIONS MAY FAVOR TORNADO FORMATION. Tune in your radio or television receiver to determine whether there is a tornado watch or tornado warning out for your area. A tornado watch means tornado formation is likely in the area covered by the watch. A tornado warning means a tornado has been sighted or radar-indicated in your area. If you receive a tornado warning, seek inside shelter in a storm cellar, below ground level, or in reinforced concrete structures; stay away from windows and doors. LIGHTNING IS THE THUNDERSTORM'S WORST KILLER. Stay indoors and away from electrical appliances while the storm is overhead. If lightning catches you outside, remember that it seeks the easiest—not necessarily the shortest—distance between positive and negative centers. Keep yourself lower than the nearest highly conductive object, and maintain a safe distance from it. If the object is a tree, twice its height is considered a safe distance. THUNDERSTORM RAIN MAY PRODUCE FLASH FLOODS. Stay out of dry creek beds during thunderstorms. If you live along a river, listen for flash flood warnings from the National Weather Service. ft/min; the curl can be as strong as 45 knots, producing a 90-knot windshear. Microbursts are not easily detectable by conventional radar due to their size, duration (no longer than 15 minutes), and because they can appear in areas without surface precipitation. Visual clues, however, provide proof of their existence. These clues include rings of blowing dust that often mark the impact point of a microburst; a rain foot—the "unfinished," outward distortion of the edge of an area of precipitation, suggesting the presence of a wet microburst; and a dust foot—the resulting plume of dust after the microburst hits the ground and moves away from its impact point. Multiple occurrences of downdrafts of this nature can continue for up to an hour; it is not uncommon for more than one microburst to occur in one area. Dust storms, so common to the southwestern United States, can wreak havoc for motorists traveling in the area. The sudden dark-brown cloud with strong winds and debris is often to blame for tragic, chain-reaction accidents. Pull off to the furthest edge of the shoulder, turn off lights and set emergency brake. If conditions prevent pulling off the roadway, a motorist should proceed at an appropriately reduced speed, turn lights on, and use the center line as a guide. A motorist should never stop on the roadway. Dust storms associated with summer thunderstorms are common in the southwestern United States and are found generally in the desert areas of western New Mexico, southern Arizona, and in the southeastern deserts of California. Dust storms develop due to the cool downdrafts of a thundershower that reach the ground and spread out in all directions, picking up dust along the way. 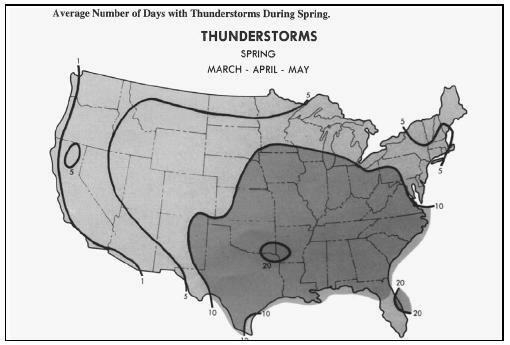 Dust storms associated with late winter and early spring storm systems are common during March and April. 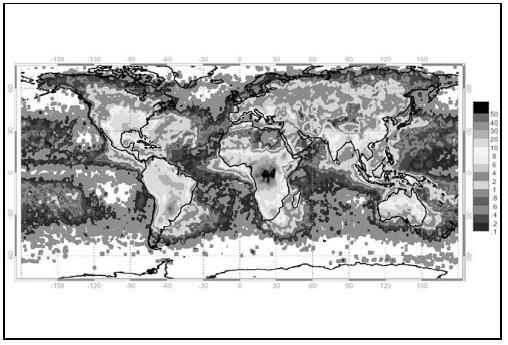 Lightning strikes Earth an estimated 100 times per second. 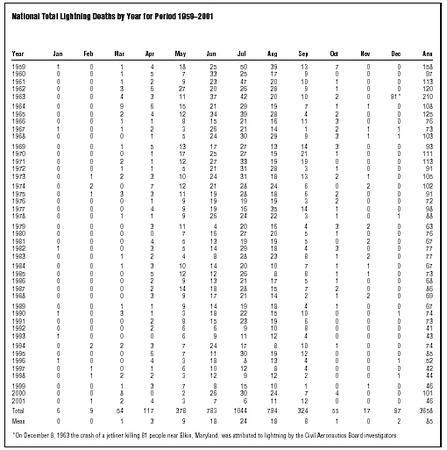 The average annual death toll for lightning is greater than for tornadoes or hurricanes. According to data assembled by the National Oceanic and Atmospheric Administration (NOAA), lightning kills about 90 Americans per year and injures about 260. Property loss—fire and other damage to structures, aircraft damage, livestock deaths and injuries, forest fires, disruption of electromagnetic transmissions, and other effects—is estimated at more than $100 million annually. Lightning is a secondary effect of electrification within a thunderstorm cloud system. Updrafts of warm, moist air rising into cold air can cause small cumulus clouds to grow into the large cumulonimbus cloud systems we associate with thunderstorms. These turbulent cloud systems tower about their companions, and dominate the atmospheric circulation and electrical field over a wide area. The transition from a small cloud to a turbulent, electrified giant can occur in as little as 30 minutes. As a thunderstorm cumulonimbus develops, interactions of charged particles, external and internal electrical fields, and complex energy exchanges produce a large electrical field within the cloud. 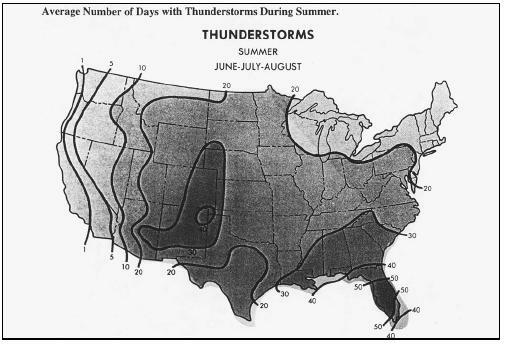 No completely acceptable theory explaining the complex processes of thunderstorm electrification has yet been advanced. But it is believed that electrical charge is important to formation of raindrops and ice crystals, and that thunderstorm electrification closely follows precipitation. The distribution of electricity in a thunderstorm cloud is usually a concentration of positive charge in the frozen upper layers, and a large negative charge around a positive area in the lower portions of the cloud. electricity, insulates the cloud and ground charges, preventing a flow of current until large electrical charges are built up. Lightning occurs when the difference between the positive and negative charges—the electrical potential— becomes great enough to overcome the resistance of the insulating air, and to force a conductive path for current to flow between the two charges. Potential in these cases can be as much as 100 million volts. Lightning strokes typically represent a flow of current from negative to positive, intra-cloud, and may proceed from cloud to cloud, cloud to air, cloud to ground, or, where high structures are involved, from ground to cloud. The typical cloud-to-ground stroke we see most frequently begins as a pilot leader too faint to be visible, advances downward from the cloud, and sets up the initial portion of the stroke path. A surge of current called a step leader follows the pilot, moving 100 ft or more at a time toward the ground, pausing, then repeating the sequence until the conductive path of electrified (ionized) particles is near the ground. There, discharge streamers extending from the ground intercept the leader path and complete the conductive channel between ground and cloud charges. When this path is complete, a return stroke leaps upward at speeds approaching that of light, illuminating the branches of the descending leader track. Because these tracks point downward, the stroke appears to come from the cloud. The bright light of the return stroke is the result of glowing atoms and molecules of air energized by the stroke. Once the channel has been established and the return stroke has ended, dart leaders from the cloud initiate secondary returns, until the opposing charges are dissipated or the channel is gradually broken up by air movement. Even when luminous lightning is not visible, current may continue to flow along the ionized channel set up by the initial step leader. Ground-to-cloud discharges are less frequently observed than the familiar cloud-to-ground stroke. In these cases, step leaders generally proceed from a tall conductive or semi-conductive structure to the clouds; the initial leader stroke is not followed by a return stroke from the cloud, possibly because charges are less mobile in the cloud than in the highly conducting Earth. Once the conductive path is established, however, current flow may set up cloud-to-ground sequences of dart leaders and returns. most frequently. Forked lightning shows the conductive channel. Sheet lightning is a shapeless flash covering a broad area, often seen in cloud-to-cloud discharges. Heat lightning is seen along the horizon during hot weather, and is believed to be the reflection of lightning occurring beyond the horizon. Ribbon lightning is streak lightning whose conductive channel is moved by high winds, making successive strokes seem to parallel one another. Beaded lightning appears as an interrupted stroke. 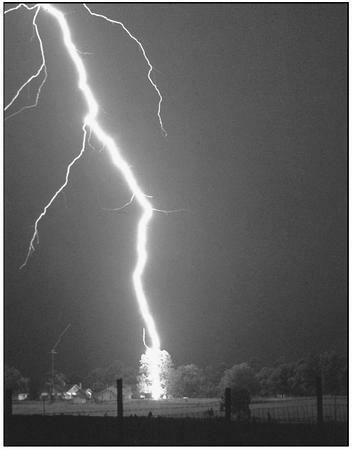 Ball lightning is in some ways the most interesting—and most controversial—form. Ball lightning has been reported in various shapes—from a luminous globe to a doughnut-shaped toroid to an ellipsoid. It hisses as it hurtles from cloud to Earth, maneuvers at high speeds, rolls along structures, or hangs suspended in the air. The dual character of lightning—it carries high currents and produces destructive thermal effects—makes it doubly dangerous. The current peaks, which may reach magnitudes of 200,000 amperes or more, produce forces that have a crushing effect upon conductors, and which can build to explosive levels in non-conducting or semi-conducting materials like wood or brick. 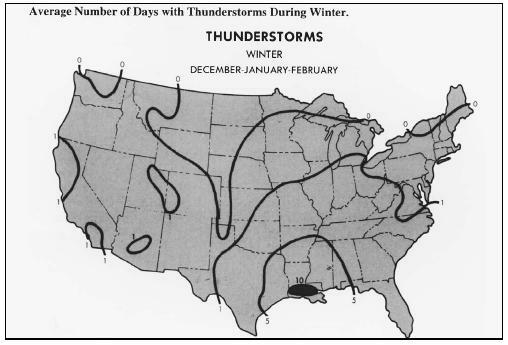 The continuous current produces heat, and is responsible for the numerous fires attributed to lightning. The peak temperature of lightning is greater than 50,000°F, about five times hotter than the visible surface of the Sun. At the NOAA, lightning is the subject of considerable scientific interest. The severe storm warnings of NOAA's National Weather Service (NWS) carry implicit alerts that lightning can be expected—and avoided. U.S. Department of Commerce scientists at NOAA's Environmental Research Laboratories are experimenting with lightning suppression techniques, measuring atmospheric electricity over the open ocean, and studying the apparent but elusive connections between lightning and other events in the atmosphere, ionosphere, Earth, and geomagnetic field. Stay indoors, and do not venture outside unless absolutely necessary. Stay away from open doors and windows, fireplaces, radiators, stoves, metal pipes, sinks, and plugged-in electrical appliances. Do not use plug-in electrical equipment such as hair dryers, electric toothbrushes, or electric razors during the storm. Do not use the telephone during the storm—lightning may strike telephone lines outside. Do not take laundry off the clothesline during the storm. Do not work on fences, telephone or power lines, pipelines, or structural steel fabrication. Do not use metal objects like fishing rods and golf clubs. Golfers wearing cleated shoes are particularly good lightning rods. Get off the water and out of small boats. Stay in your vehicle if you are traveling. Vehicles offer excellent lightning protection; however, avoid parking near large trees or power lines. Seek shelter in buildings. If no buildings are available, your best protection is a cave, ditch, or canyon. If in a wooded area, take shelter under the shorter trees. When there is no shelter, avoid the highest object in the area. If only isolated trees are nearby, your best protection is to crouch in the open, keeping twice as far away from isolated trees as the trees can act as lightning rods. Avoid hilltops, open spaces, wire fences, metal clotheslines, exposed sheds, and any electrically conductive elevated objects. When you feel the electrical charge—if your hair stands on end or your skin tingles—lightning may be about to strike you. Drop to the ground immediately. Persons struck by lightning receive a severe electrical shock and may be burned, but they carry no electrical charge and can be handled safely. A person struck by lightning who shows no vital signs can often be revived by prompt mouth-to-mouth resuscitation, cardiac massage, and prolonged artificial respiration. In a group struck by lightning, the apparently dead should be treated first; those who show vital signs will probably recover spontaneously, although burns and other injuries may require treatment. Recovery from lightning strikes is usually complete except for possible impairment or loss of sight or hearing. refracted and modified by the turbulent environment of a thunderstorm. Because the speed of light is about a million times that of sound, the distance (in miles) to a lightning's stroke can be estimated by counting the number of seconds between lightning and thunder, and dividing by five. The electromagnetic impulses of a lightning stroke produce whistlers—gliding tones that travel along lines of force in Earth's magnetic field from their lightning source in one hemisphere to a similar point in the opposite hemisphere, often echoing back and forth several times. Their sound is something like the whistle of World War II bombs, occasionally modified in a way that produces musical variations. Hailstones are precipitation in the form of lumps of ice that form during some thunderstorms. Hail can range in size from that of a pea to a softball. Hailstones are usually round, but may also be conical or irregular in shape, some with pointed projections. While it takes about one million cloud droplets to form a single raindrop, it takes about 10 billion cloud droplets to form a golf-ball-size hailstone. Hail is formed as ice pellets (which were initially snowflakes or frozen raindrops) strike supercooled water droplets within a storm cloud. The supercooled water flows over the ice particles and part of it freezes instantly. Some of the unfrozen water remains attached to the growing hailstone until it freezes, and part of it slips away. This continues until the weight of the hailstone can no longer be supported by the updrafts, and it falls to the ground. The multiple trips through up- and downdrafts result in alternating bands of clear and cloudy ice within a hailstone; as many as 25 layers have been counted in one hailstone. Of the thousands of thunderstorms that strike the United States each year, only about 10–15% produce potentially dangerous hailstones. Hail-producing thunderstorms are most frequently found in eastern Colorado, Nebraska, and Wyoming (the city of Cheyenne, Wyoming, observes the most hailstorm days per year, about 8–10); such storms also develop in the western plains, the Midwest, and the Ohio Valley. 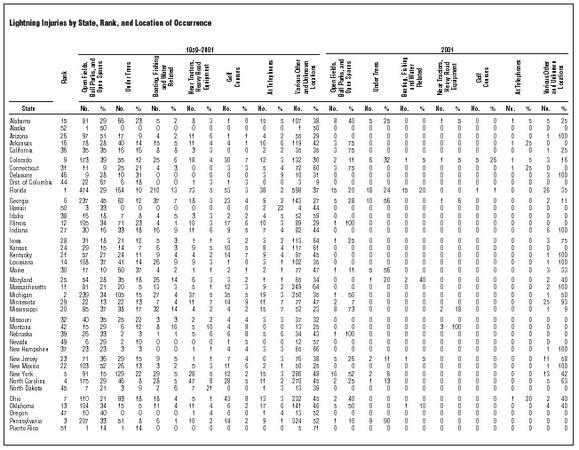 Damage estimates from hailstorms alone reach up to nearly a billion dollars annually in the United States. The most costly single U.S. hailstorm struck on July 11, 1990, in Colorado Springs, Colorado, and resulted in damages of $625 million. Golf-ball- and baseball-size hailstones pelted thousands of roofs, vehicles, windows, and other property. Hail also causes injuries, but rarely death. In fact, during the twentieth century, only three deaths were reportedly due to hail—one was a farmer in Lubbock, Texas, in 1930; an infant in Fort Collins, Colorado, July 30, 1979, and a 19-year old man struck by softball-size hail in Lake Worth, TX, on March 28, 2000. 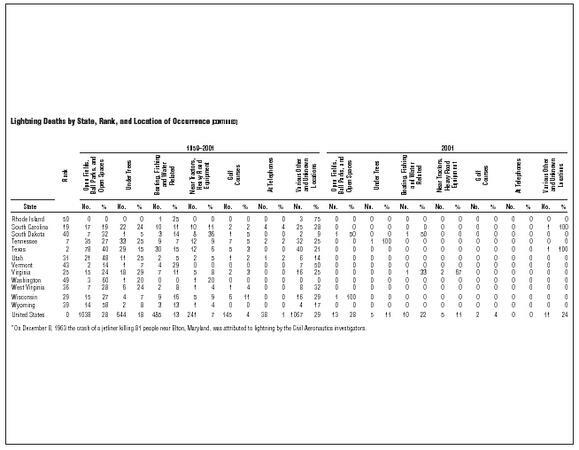 Injuries are also sparse, but more common. 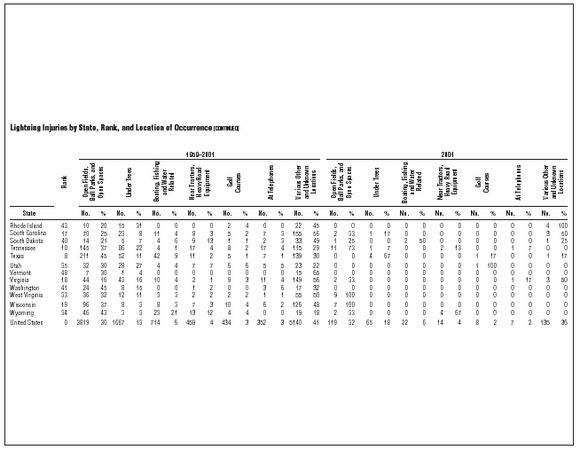 In the last full year of statistical hail data (2001) there were 32 hail injuries reported in the United States. TRUTH: Lightning often strikes outside of heavy rain and may occur as far as 10 miles away from any rainfall. This is especially true in the western United States where thunderstorms sometimes produce very little rain. TRUTH: Rubber-soled shoes and rubber tires provide NO protection from lightning. The steel frame of a hardtopped vehicle provides increased protection if you are not touching metal. Although you may be injured if lightning strikes your car, you are much safer inside a vehicle than outside. TRUTH: Lightning-strike victims carry no electrical charge and should be attended to immediately. Contact your local American Red Cross chapter for information on CPR and first aid classes. TRUTH: "Heat lightning" is a term used to describe lightning from a thunderstorm too far away for thunder to be heard. Lightning struck the spot where this woman was standing minutes after she left. Can lightning hit twice, from the same storm, at the same location? Yes. On July 19, 1993, at about 4:30 P.M. , a mile and a half south of Winnsboro, SC, four people sought shelter during a thunderstorm. Lightning struck a nearby tree showering the car with debris. The storm weakened and the driver got out to clean the top of the car, saying "lightning never strikes twice in the same spot." As he touched the car handle to enter the car, lightning struck again. He was appeared to be dead, but people rushed over, administered CPR, and brought him back to life. The lightning blew the soles off his wife's shoes as she stood by the side of the car, but she was not seriously injured. How rare was it that lightning would strike the same low ground location twice from the same storm and about the same time? A 50-foot structure will be struck about once every four to six years, and a quarter acre of flat land (a large residential lot) will be struck about once every 100 years or more. Any structure, no matter what its size, may be struck by lightning. The moral of this anecdote is to stay indoors until you are sure the storm has passed. You can hear thunder when the storm is within 10 miles or so, and are at risk if you can hear thunder. June 17, 1987 … Harrison Co., MS. A couple was walking on a beach. Two Air Force sergeants were eating lunch and saw the lightning strike the two people. They ran to the man and woman and found the man conscious, but his wife was not breathing. One of the sergeants began CPR while the other called the police. She survived thanks to the two men. May 31, 1998 … WI. During the early morning hours, south central and southeast WI experienced an unprecedented and widespread downburst wind event known as a "derecho." Incredibly powerful, hurricane-force, straight-line winds, with peak gusts of 100–128 mph tore through 12 counties, and another eight counties had peak gusts to 60–80 mph. Newspaper headlines included: "Nature's Spring Cleaning," and "Traveling Back to the Dark Ages." A 48-year old Washington Co. woman was killed when a tree fell onto her house as she was sleeping. Another 32 people were injured during the storms. 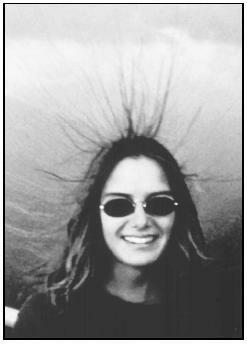 July 28, 1999 … Lake Powell, AZ. At least two fishing boats were swamped and other Lake Powell visitors had to take shelter when violent thunderstorms pounded the area, creating swells between six and eight feet high. No injuries were reported, but flash floods on the lake's shore roared through a campground and closed roads. In another emergency, three adults and four children on their way from Rainbow Bridge to Warm Creek were forced to beach their boat when waves made the going too treacherous. A nearby boat took them in. In another incident, a boat took in 10–15 people for the night when their boats proved too risky. April 9, 1995 … Cochise Co., AZ. A dust storm along Inter-state 10 near Bowie caused the death of 10 people and injured another 20 people as vehicles piled into each other in near zero visibilities. March 28, 2000 … Tarrant Co., TX. A 19-year-old male was killed when struck by softball-size hail at Lake Worth while trying to move a new car. He died the following day from associated head injuries. He is only the third person directly killed by a hail strike since 1900. May 23, 2001…Adams Co., CO. A strong, dry microburst swept a woman up into a swirl of dirt and carried her approximately 150 feet. The woman was in an open field, corralling a yearling horse, when the incident occurred. Fortunately, she received only minor injuries. Standing under a tree is one of the most dangerous places to be during a thunderstorm. This map shows the incidence of lightning strikes annually around the world. *On December 8, 1963 the crash of a jetliner killing 81 people near Elkin, Maryland, was attributed to lightning by the Civil Aeronautics Board investigators. *On December 8, 1963 the crash of a jetliner killing 81 people near Elton, Maryland, was attributed to lightning by the Civil Aeronautics investigators. WOW.. thanks for your thorough and amazingly detailed information. This was EXACTLY the info we needed to complete our report on Thunderstorms! I am a very great Thunderstorm enthousiast for which reason I already often visited Florida during the rainy summer season. But as I have understood the African Congo bassin belongs to the most Thundery places on earth, if it is not the most Thundery place on this planet. So I am looking for more information about this part of the world as far as Thunderstorms are concerned. Do you happen to know a website with information on this point? 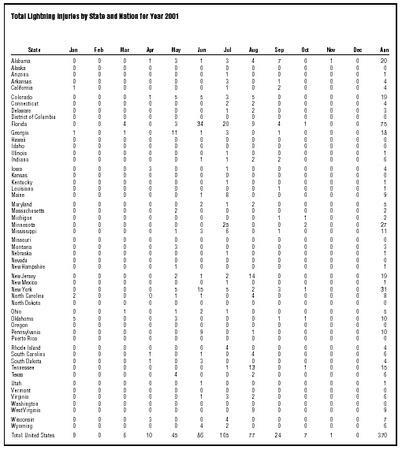 Is data available by month in addition to season. I hope to kayak from Pierre SD to St Louis next year either from mid June to mid July or from early August to early Sept. I would like to know which time period is preferable based on wind direction, wind velocity and thunder storms. 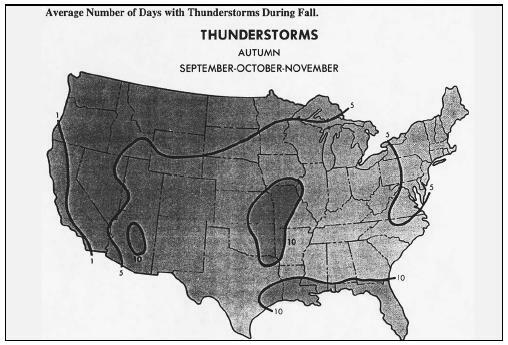 I have a really big question: What is the lowest wind speed ever recorded for thunderstorms? I was wondering what the average temperatures and humidity in a thunderstorm are.